About four years ago there was a great blog post by Ancient_of_MuMu called The Moustaches of Sci-Fi Calender. I'm not going to do a calendar. I could force another seven characters onto the list, but frankly the eye-patch look is harder to pull off than you might think. So I'm going with the Top 5. 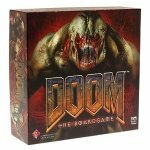 DOOM: The Board Game was released in 2004 by Fantasy Flight Games only to be unfairly maligned as being too difficult to win. This review aims to set the record straight about the real good and bad points about this game. Make no mistake though as this is ultimately a positive review about what I consider to be both the greatest sci-fi dungeon-crawler board game ever made and one of the best tactical miniatures board games ever made. In 2008 the classic Risk board game was released with a revised rule set, which among other changes made the game more goal-oriented and significantly shorter to play. Risk Halo Wars is clearly based on that same revised rule set while adding in its own flavor. That’s right; this is not a simple word-for-word reprint of the revised rules as some have speculated it would be. This month in the doghouse we played Imperial Assault, Merchants & Marauders, DungeonQuest, and more. This started out as one of my usual rambling forum posts, but it's a slow news day so I've cleaned it up a bit to make it more suitable for a front page article. Still, I'm not known for coherent writing so attempt to read at your own peril. This month in the Doghouse we played Merchants & Marauders, March of the Ants, Lords of Waterdeep, and a few others. My attempt at a new gaming blog that I will be making a serious effort to keep up with monthly. This month in the doghouse we played Imperial Assault, Lords of Waterdeep, and RoboRally.